This magnificent apartment is located in a beautiful 17th century building in the very centre of Paris. 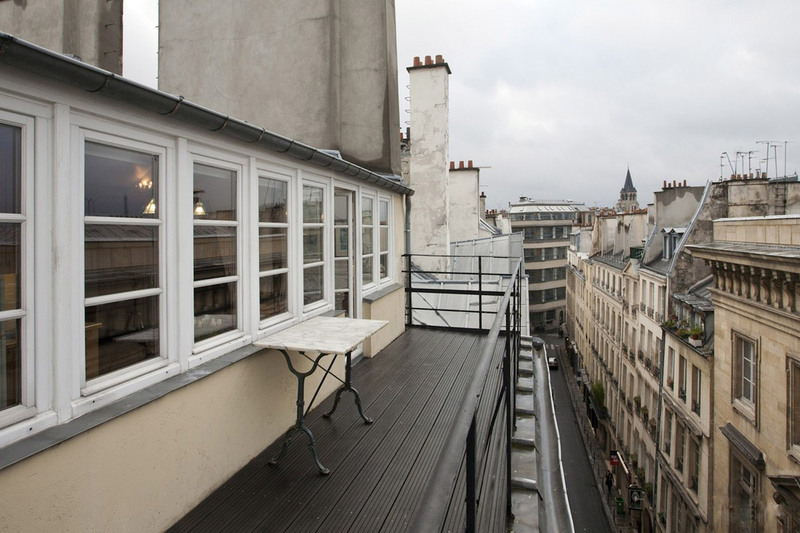 It has a wonderful 12m2 terrace with views over the Parisian rooftops. This sunny apartment has a large veranda that leads onto a beautiful terrace with wooden flooring. The lounge has a sofa bed 120x200, a bed in mezzanine 90x200, an armchair, table and chairs. There is a fully-equipped modern kitchen.The parquet flooring and wooden beams lend the apartment a warm and pleasant ambience. The bedroom has a double bed 140x200 and the bathroom has a bathtub. The apartment is ideally located in the very heart of Saint-Germain-des-Prés, 100 metres from the River Seine and enables guests to move quickly and easily around the city. The terrace offers a wonderful view over the whole area of Saint Germain, the Louvre, the Pont des Arts, Pont Neuf, the Eiffel Tower, and the Basilica du Sacré Coeur; all located very close to the apartment. The area is also one of the most pleasant in the city and well-loved by the Parisian locals for its originality and peaceful atmosphere, in which you will find numerous shops (banks, supermarkets), as well as a good selection of restaurants for all tastes and preferences and some typical Parisian bars. The apartment is also close to the stations Odéon, Saint-Michel, Pont Neuf and Saint-Germain-des-Prés (although it is possible to visit most places on foot). The Eiffel Tower and Trocadéro, are a 10 minute metro ride, as well as the Grands Boulevards with its designer shops of worldwide recognition, and the Opéra Garnier, the Bastille and Père Lachaise. Make the most of a romantic boat trip on one of the bateaux mouches along the River Seine (and see Paris from a completely different angle) or for those travelling with the family a visit to Disneyland or Versailles is just 50 minutes by RER (Parisian regional train service). Please with your desired dates and we will answer very quickly! Small, Quaint and beautiful. Great location, however having a map of Paris would have been beneficial. Excellent accommodation!! It was even better than the pictures online. Charming apartment, excellent location in the 6th, walking distance to everything and beautiful views! Some more comfortable single lounge chairs would have been appreciated. THe 2 single ones looked good but were not that nice to relax in. Nice location, quiet and central. The terrase was wonderfull. The only observation is that it was not possible to close the sleeping room, because there was no door. the accom was great, beautiful view over paris. At lot of stairs but we knew of this before we arrived. It was very hot in paris while we were there, would have loved a fan in the apartment. Overall the apartment was just what we wanted, clean and tidy, all the amenities we needed and a big terrace, would definately recomend! Stilvolles Apartment, hält alles, was in der Beschreibung versprochen. Ideal für kurzen Aufenthalt. Die Wohnung, die Terasse, die Aussicht und die Lage sind der absolute HIT! Wir können diese Unterkunft absolut weiterempfehlen! Wir haben die Tage in Paris sehr genossen! Vielen Dank! Was really impressed with the apartment. It had all the extras needed to make it perfect for us. Appartamento davvero squisito. Posizione ottima. divisione interna eccellente. Unico piccolo neo è il 5° piano senza ascensore, ma nel complesso la valitazione non può che essere positiva. Ein sehr schönes Appartement in der Innenstadt von Paris im lebensfrohen Viertel St. Germain. Der Louvre und Notre Dame sind bequem zu Fuß erreichbar (mit roten Fußgängerampeln 15 Minuten Gehweg). Das Appartement befindet sich in der 6. Etage eines typischen historischen Mietshauses, in dem es ...selbstverständlich auch einen freundlichen Concierge gibt. Die vielen Treppen dorthin sollte man ganz positiv als Fitnessübung sehen. Die Terrasse über den Dächern von Paris ist eine ruhige Insel im Gedränge der Großstadt. Im Appartement selbst war alles sehr in Ordnung und auch sehr sauber. Der Vermieter ist sehr freundlich - Übernahme und Übergabe funktionierten reibungslos. Wir empfehlen dieses Appartement gern weiter. Ubicación privilegiada, muy lindo departamento, con todo lo necesario para una estadía perfecta. Como fuimos en pleno invierno, nos preocupaba un poco que tuviera parte del techo de vidrio y tantas ventanas, pero la calefacción es excelente. La falta de ascensor? buen antídoto -aunque no ...suficiente- para la exquisita comida francesa. Sin lugar a dudas, para recomendar y volver. IMPECABLE. Gracias por hacer tan fácil conseguir un buen alojamiento en París! Our family had a wonderful stay in this apartment. The location was perfect, a quiet, peaceful street with a lively neighbourhood with great eateries, open till all hours just a 2 minute walk away. The expansive windows and doors opening onto a balcony with views over Paris was a rare and treasured ...aspect of the apartment. All our needs were met and the owners were most helpful. The lack of a lift was the only downside, though after a few days in Paris, it no longer seemed to matter and we were all a lot fitter for the 5 flights of stairs. You might like to keep those stairs in mind when packing your suitcase though. All in all the perfect place for us. Demasiado caluroso y con hormigas en la cocina. Fue fantástico. Fuimos con dos niños de 7 y 9 años y estupendo. Todo muy muy cerca. No fue ningún problema el 6º sin ascensor, no es para tanto. La terraza una pasada. Me gusta.Una buena u fiel información . Meinen Eltern hat es ausserordentlich gut gefallen in Ihrem Appartment in Paris. Alles war zu ihrer besten Zufriedenheit, und sehr empfehlenwert. 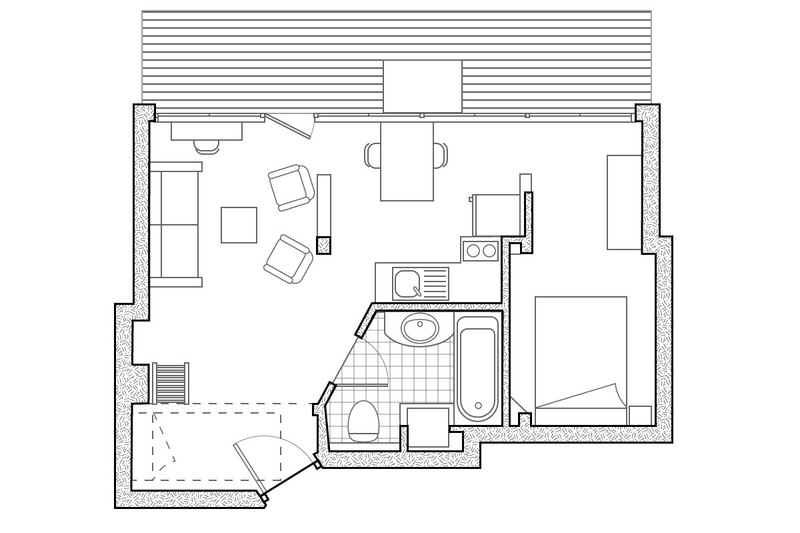 This apartment is great in every aspect, just as it appears in the booking page. Only one minor hick-up: that we were made very anxious for a while standing helplessly on the street when we couldn't open the street door and make contact with the owner, before the owner finally opened the door from inside and told us that the door code was changed. Die Beschreibung der Unterkunft entsprach genau dem was wir vorfanden. Die Ausstattung war sehr gut, alles sehr ordentlich und sauber, die Lage hervorragend und die Kontaktperson sehr nett und freundlich. Half uns mit einigen Tipps für Paris weiter. Wir sind vollends begeistert. Exactly as described on the website. Charming, comfortable, well equipped, fantastic panoramic view of Paris. Very conveniently located, with shops, restaurants and Metro stations all within a couple of minutes' walk. The owner, Olivier, was very friendly and helpful. The lack of a lift to the ...5th floor may be offputting to some (especially with heavy luggage) but we didn't find it a problem. In fact we felt much fitter and all the better for it! El departamento es muy lindo con vistas muy buenas,no es aconsejable para personas muy mayores o con niños muy pequeños por los 5 pisos por escalera.Estaba muy prolijo y limpio. Me parece muy alto el porcentaje que hay que dejarle al dueño .En micaso 300 euros,que no me sirvieron en el resto del viaje por que dejaba la comunidad europea esa tarde. La terrasse et la vue est inoubliant! Il faut avoir des poumons en bon condition (6 escaliers! ), mais ca vaut absolument la peine! Excellent standard of accommodation. Clean and bright. Bed very comfortable. Bit of a trek up the 122 steps but worth it, particularly in light of its very central location and the advantage of a terrace. Would book again without doubt. Caratteristico e romantico e consigliabile per coppie. Het appartement is mooi, er komt veel licht naar binnen. Bij mooi weer is er de mogelijkheid om op het balkon te zitten. Het appartement ligt centraal en de contactpersoon is erg aardig en meedenkend. Een klein aandachtspuntje is wel dat je redelijk veel trappen moet lopen voordat je bij het appartement bent. Er is geen lift. The apartment was lovely and clean, the bed was very comfortable. We enjoyed sitting on the balcony all times of day and night. The street was quiet considering it was a busy area. We stayed for eight nights and would definitely stay again. The owner was very helpful and easy to contact by phone to access apartment on first day. 9,5 Die Küche hätte ein bisschen sauberer sein können, aber sonst wunderschöne kleine Ferienwohnung. just not to underestimate the 125 steps upto the property, especially if the weather is humind!! Sehr hübsch, sehr gute Infrastruktur. Excelente ubicación, a media cuadra del Sena y a unas cuadras de los pubs, bares, y resto de Saint Germain, con lo que se encuentra en una zona silenciosa. Fui en epoca de invierno, pero el sistema de calefacción es excelente. Lo unico, al ser un edificio muy antigüo, no hay ascensor. Si llevan maletas pesadas, cuidado al subir los 6 pisos! We loved staying in this apartment. It's in a great location in Paris a short walk from Notre Dame, the Louvre, the Musee d'Orsay and good restaurants and cafes. It was clean and had a useable kitchen where we made a few meals. The owner was very friendly and punctual. It was really lovely sitting ...on the balcony having a glass of wine and looking out over the city. As mentioned in the description, there are quite a lot of stairs, so this apartment may not suit the elderly. Erstklassige Lage in angenehmem, lebendigen Quartier. Hübsche, gemütliche Wohnung, sehr gut ausgestattet. Netter, unkomplizierter Empfang. Unbedingt empfehlenswert! Great location, comfy bed (although sofa bed is not) and great balcony/terrace. 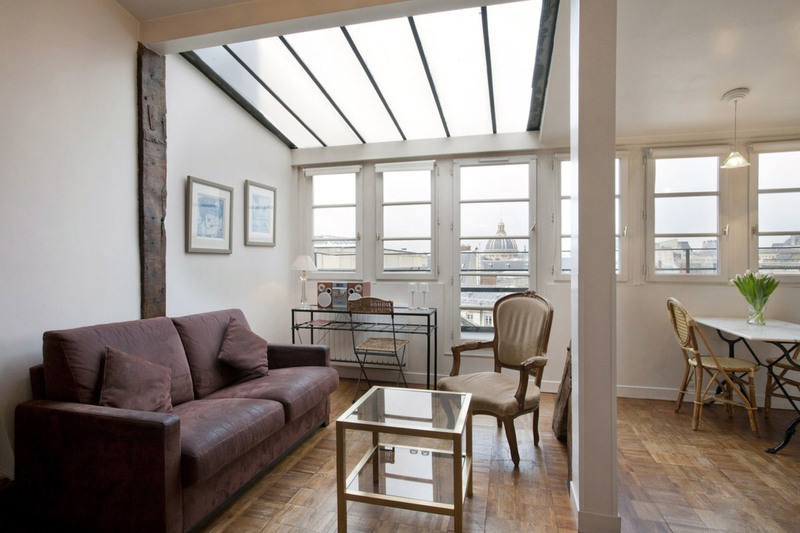 The apartment is in a great location...easy access to all Paris! We loved the rooftop terrace. Wine and cheese never tasted so delicious! The apartment is decorated in a rustic chic style, which added to its charm and we didn't lack anything! Yes, the many stairs up to the unit can be a ...challenge, but climbing them once, or twice a day, means you can enjoy more French food! Die Wohnung war gut gereinigt, die Kontaktperson sehr freundlich. Alles, wie es sein soll. This apartment is, as everyone else says, in an excellent position. The perfect Parisian experience. Everything we required was on hand, plus the added bonus of some food basics. And those stairs..... well worth it to have that view over the rooftops, although somewhat more challenging when every ...second one is being painted!! Love this apartment and will be spreading the word amongst my traveling friends. 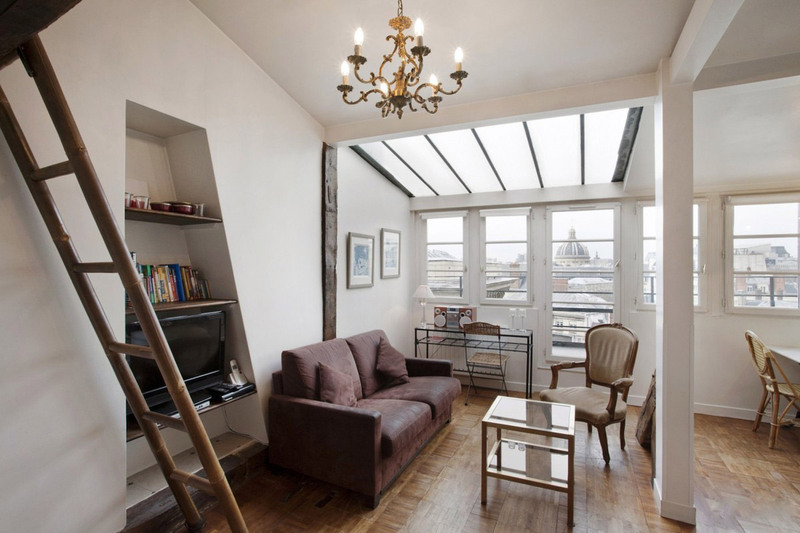 For two womant travelling alone this was a wonderful apartment in the centre of Paris with easy access to all sites!! The apartment was well equipped and beautiful, with lots of light and air, and a balcony with magnificent views over Paris rooftops, as well as the Eifel tower! I would definately rent it again! Très petit mais pour deux parfait! Equipement complet de cuisine! Very authentic Parisian experience in a 17th century building! We loved the appartment especially the deck. Our 2 sons had lots of space and their own beds. I liked the decor and the ambiance! Excellent location! Easy stroll to all the restaurants, bars, shops and transport. Also just around the corner from France Tourism which is the pick up spot for all their tours. Apartment very quiet and provided good space, especially with your own terrace! It was lovely and clean with all ...facilities in good condition - just as we had seen in the photos when we booked. We had great communication with the owner from the moment we booked and it was a pleasure to meet him at the apartment. Would highly recommend this apartment so long as you're ok with stairs. The apartment was particularly good, with a comfortable design and a lovely light interior. The view was excellent and we really enjoyed coming back here at the end of each day. It was well worth the climb up the stairs. O. was very kind and helpful and the apartment elegantly furnished throughout. We would love to stay here again. Comfortable appartment, everything as promised and more. Beautiful view. Friendly and helpful owner. Perfect location. I would definitely recommend this appartment. Die Wohnung ist ein absoluter Traum! Die Treppen bis zum 6. Stock sind nicht so schlimm, davon sollte man sich nicht abschrecken lassen. Man wohnt im schönsten Viertel von Paris, kann sehr viel zu Fuß machen und es ist ruhig. Vor allem die Terrasse ist schön und der Blick einmalig. Das Treppensteigen lohnt sich! Die Aussicht von der Terrasse ist einfach einmalig! Sehr nette und hilfsbereite Vermieter. Die Umgebung ist ruhig und trotzdem sehr zentral gelegen. Haben uns rundum wohl gefühlt!! Great location and wonderful view from the balcony over rooftops and particularly the Eiffel Tower. Everything in the apartment was as expected - or even better - there was a fast wifi connection, international TV channels, and a very well-equipped kitchen. Kind and helpful owner who was very ...service minded. Before we arrived, we asked some questions about the apartment and about parking, which he answered immediately. There is a small grocer's just round the corner and a small market, a large baker's, and a small Carrefour 5 minutes' walk away. Plenty of bars and restaurants in the neighbourhood. We - family of 4 with 2 teenage daughters - hope to be back soon. This apartment was a joy, the owner O was very helpful, he met us at the apartment and explained everything we needed to know to have a comfortable stay. The location is excellent and you can walk 5 minutes and be at the Louvre. You must love stairs to stay here as there are quite a few, but the ...view once you get to the apartment is amazing. You have a good view of the Eiffle tower ( top half ) and at night you can watch the light show on the tower. You can also see the top of the Louvre. The apartment is comfortable and while not the biggest, it is perfectly formed, just watch the beams in the middle of the night. Highly recommend this apartment for any couple that want to spend time in Paris, but still have just a little room to relax. this apartment is in a fantastic location with the Seine 50 metres away and the Louvre and Notre Dame just over the river. The local area is very vibrant and interesting. Staying here is much more of a real Paris experience than a generic style hotel would be. I would recommend to couples (able to ...climb all the stairs!) wholeheartedly. We had 2 older teen with us and the sofa bed and bed on a mezzanine platform were not so comfortable. But the views also make everything worthwhile. Beaucoup plus agréable qu'à l'hôtel! La ubicación es óptima. El departamento está bien puesto y tiene una linda vista. El trato con el propietario fue muy bueno. Altamente recomendable, con la salvedad de que hay que subir a pie varios pisos. The location was excellent. Everything we wanted to see was within walking distance. Plenty of shops, restaurants. Sehr nette Kontaktperson und gute Lage. Die Wohnung könnte ein wenig gemütlicher eingerichtet sein und die Matratze ist etwas durchgelegen aber die Wohnung ist trotzdem völlig in Ordnung. Loved it! 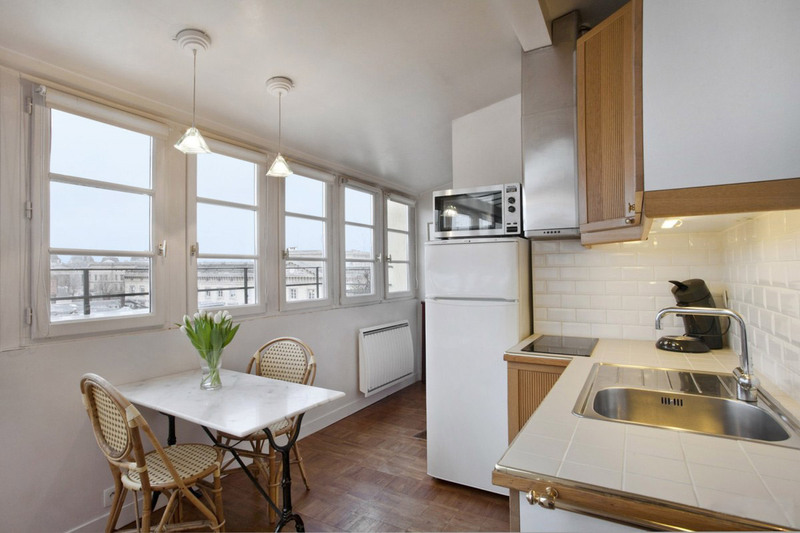 This is a really great apartment in a lovely area with views of the Eiffel Tower, Louvre and Sacre Cour from the balcony. There are some great restaurants and bakeries only a few minutes away too. Will definitely stay here again.O. was lovely as was his mother A., who met us on arrival.My ...only small criticism of the apartment is the sofa bed which is a little uncomfy and is creaky when you turn over - not a big problem though! The location and views from this apartment are SUPERB! A 4 minute walk to Saint Michel metro and train line and the beautiful Seine. The apartment is super secure, with 2 code-controlled access doors and then a key for the apartment front door. The apartment was rather hot when the weather was warm ...but that was to be expected with the glass roof but I rectified that by leaving the blinds down when I left for the day. The bedroom also stayed cool which was great when it was time to sleep. All in, I would highly recommend this apartment. O is also lovely and has excellent English. The apartment had amazing views and the location was the best. We couldn't have asked for better on our first visit to Paris. Hello, i stayed at this wonderful apartment and just loved it. It was exactly how it was depicted in the photos and even better when actually standing on the balcony and taking in the beautiful views of La Belle Ville. I also enjoyed meeting the owner and I rate your booking site and information concierge as top notch. The view was just amazing. Apartment ammenities were just right. The owner was very accomodating. Check in and check out were a breeze. Everything was spot on! The only thing I didn't like and this has nothing to do with my accomodation was the daily and fresh poop outside the street of the apartment. This place is such a gem in the heart of Paris! Wonderful location, accommodating host and lovely views. I even didn't mind hiking up the six flights of stairs knowing the views we would see once at the top. Enjoyed every minute and would definitely stay again. Owner is very personable and helpful. Perfect location near Isle de la Cite for major sites and transportation. Spacious rooms with balcony and top floor views. Kitchen and clothes washer a real plus but drying was on a folding rack. Only drawback was the long flight of stairs to the top floor.... I am almost too old for that. All in all a good option for an extended stay. Wenn wir wieder nach Paris fahren, dann auf jeden Fall wieder in dieselbe Wohnung! Aber nur für 2 Personen  für 4 Personen finde ich die Wohnung nicht geeignet  außer für 2 Erwachsene, 2 Kinder bis 14. Das Haus und die Wohnung haben Charme, alles sauber und gepflegt  der Balkon ist das ...Beste an der Wohnung und die Lage ist Top für einen Kurzurlaub in Paris! This apartment is in a wonderful area!! The bed was very comfortable! It was a little warm during our stay, but they had a fan that helped a lot. The only negative side to this apartment was having to climb 6 flights of stairs! On the bright side, it encouraged us to stay out and enjoy Paris! Our stay here was amazing! The location could not have better, the apartment was beautiful and the view is incredible! The host was so nice and helpful and helped us with some postal issues we had. I have no complaints whatsoever, and highly recommend this apartment! The six flights of stairs could be tough, but they're worth it for the view, the terrace, and the lovely apartment. It was clean and bright, and O, the owner, was very accommodating and prompt. I would stay here again. Location and a superb view from the apartment and the big terrace. I booked the flat based on pictures and description as I wanted something central and safe, where I could stay alone and feel safe walking home, if the friend that I was meeting couldn't make it. The flat was well equipped and exactly as described, and we had a wonderful time. The views alone were ...worth the 114 steps up to the rooftop aerie and its' balcony from where we could see the Eiffel, the Louvre and Sacre Coeur. Building is very typical for its' age, but with excellent plumbing. It is not recommended to lean over the balcony railing if you suffer from vertigo.O and his sister were very nice and accommodating and communication went smoothly. The were flexible with our earlier check in and out times which was much appreciated. Thank you both. The apartment was in a great location - quiet but close to everything Paris has to offer - sites, shopping, transit and great food. It's a large apartment with everything we needed for our one week vacation. We never used the tv but we did do laundry and found that the clothes were so dry ...coming out of the washing machine that they dried over night on the rack, and we didn't have to worry about there not being a clothes dryer in the apartment. The stairs were tough on the first day but easier as the week went on and well worth the effort for space we got.The hosts were available throughout our stay to help us find services in the city and answer any questions we had.